Max Weber's writings in The Sociology of Religion are today acknowledged as a classic of the social sciences in the twentieth century. They are key texts for understanding Weber’s central sociological concepts concerning Western and Eastern ‘civilisations’. This book argues that the concept and problematic of personality plays a pivotal role within these works. 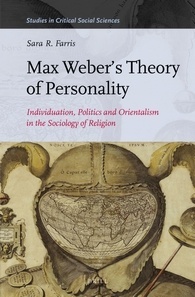 Providing a detailed reconstruction of this concept within Weber’s systematic studies of world religions as well as throughout his methodological and political writings, this book shows its complex development within three strictly related problematics associated with Weber’s influential comparative historical sociology and theory of social action – individuation, politics and orientalism. Together they shape and constitute what is distinctive in Max Weber’s theory of personality.